The Northern Territory Government provides funding directly to schools through the School Resourcing Model. It also provides funding indirectly for the strategic focus areas of quality teaching, school leadership, community engagement, data and accountability and differentiated support for schools. Schools may also generate funds through fundraising, facility hire, educational supply sales, educational items, optional extras, voluntary contributions and grants. Under the School Resourcing Model schools have flexibility and autonomy to decide how to use their resources. *A weighting does not currently apply to this category and all schools receive a flat rate of $1000 annually for every full time equivalent effective enrolment, inclusive of preschool, to meet the costs of delivering educational support and inclusion for students with additional needs. Student information is collected in August of each year and validated by principals, as part of the National August Census. The census information is used to create a student needs profile for the school from which the school’s average per student rate is calculated and communicated to schools in October. This informs the preliminary funding available for the School Resourcing Model for the following year. In February/March funding under the School Resourcing Model is adjusted based on the number of students at the school for the current year. Total funding is published in April/May. Fixed funding is provided for school operational costs such as electricity, water, telephone, cleaning and ground maintenance and non-urgent minor repairs. Targeted funding responds to individual students on top of the student needs based funding formula. Targeted funding programs include special education schools and centres (enrolling students with disability), intensive English units, centres for excellence, child and family centres and targeted programs driven by other educational needs. Central funding for schools costs includes items such as teacher remoteness allowance, principals’ salaries, teacher relocation costs, remote study leave and teacher long service leave. Schools receive their final funding based on the School Resourcing Model each year. To find your school’s funding enter your school name in the search below. The per student rate is determined by the student needs specific to each school and based on validated student information at August of the previous year. Fixed and targeted school funding is not included in the per student rate. Please contact your school if you require further information . Schools also generate funds from fundraising, facility hire, educational supply sales, educational items, optional extras, voluntary contributions and grants. governance and development services, such as finance, human resources, information technology and other corporate costs. The NT Government is the main funder of government schools in the Territory. Australian Government schools funding is determined using the Schooling Resource Standard. The Schooling Resource Standard is only used to determine the distribution of Australian Government school funding to each state or territory. 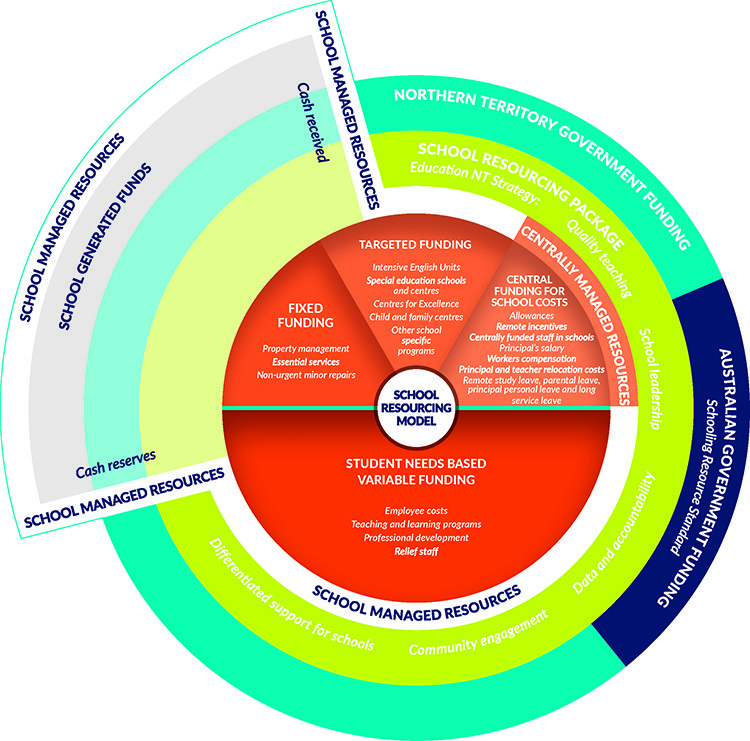 Northern Territory Government and Australian Government funding is distributed through the School Resourcing Package and the School Resourcing Model informed by the Education NT Strategy. It includes both direct costs (e.g. teacher salary), and indirect costs (e.g. quality teaching, school leadership, community engagement, data and accountability and differentiated support for schools). Information on the total resources (direct and indirect) provided to schools can be found on the MySchool website. The MySchool website gives information about each of Australia’s schools. It includes a school’s student profile, NAPLAN performance, funding levels and sources based on expenditure and other financial information as well as enrolment numbers and attendance rates. The financial information is published for a completed calendar year. Please contact your school for further information.